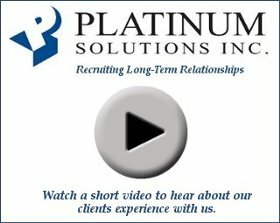 Platinum Solutions, Inc. is an employment service offering one-stop solutions for both Clients and Candidates. We are licensed and bonded to help merit our Client’s and Candidate’s complete confidence. At Platinum Solutions, Inc. we take pride in offering a specialized, hands-on approach that brings better candidates to employers and better companies to job seekers. We’re not in business to waste your time. Whether you’re seeking a contractor, full-time employee, part-time employee, outplacement services, or payroll services our Employer Services can provide a solution that works just for you. In addition, we hold face-to-face meetings with our Clients at their facilities so that we can experience the work environment, meet their team, understand the products and services they provide and most importantly, gain an appreciation for their specific needs and how we can best assist them. We will meet with you face-to-face and get to know the person behind the résumé. We will identify your career objectives and goals to help prepare you to conduct the most effective job search possible. Our Candidate Services can cover everything you need to gain employment.